London Close-Up Magicians - Christopher Howell & Co. If you're trawling through sites of London Close-up Magicians, it may all be rather overwhelming. But you can look a bit closer now... 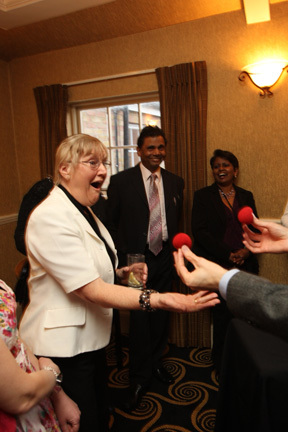 When you book the magician Christopher Howell, your guests should be prepared for a show that they'll never forget (for the right reasons!). His performance approach is entertaining and sophisticated and clients tell us repeatedly that his magic continues to be talked about for ages after the event. Christopher performs throughout Greater London, around the UK and abroad. In his close-up magic performances, Christopher often borrows objects from guests that he uses to perform with and they frequently help out with the action. Live magic. Close quarters. Unforgettable. He is in great demand for his work presenting his magic close-up as a wedding magician, for London corporate events and private parties year round. London close-up magicians present magic for small groups of guests either as they mingle with drinks and canapes or are seated at tables. The power of professionally-presented close-up magic is indisputable, as it happens inches away from the audience's very own eyes! Christopher performs with a variety of objects including cards and items borrowed from the audience. It’s flexi-time, depending on your needs, the number of guests, and the length of your event. "Christopher is a fantastic entertainer. We loved the way he mingled with the guests but was also very discreet and professional. His magic was amazing and was enjoyed by all. Initially I wasn’t sure whether having a close-up magician could be ‘cheesy’ but Christopher's magic and performance style are pure class and very sophisticated and I would recommend anyone organizing a special event to have him perform. Absolutely brilliant."